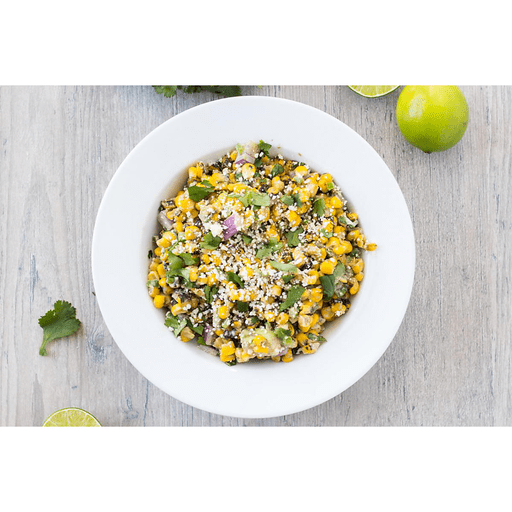 Colorful, crunchy and a little bit spicy - this Mexican Street Corn Salad recipe features the traditional flavors of a popular Mexican street food called elote or grilled corn slathered with a chili-lime sauce. Instead of the traditional fresh sweet corn, we use frozen roasted corn because it's packed with flavor and can be found any time of the year. Try it as a yummy side dish salad or add it tacos and bring the flavors of Mexico to your home! 1. In a small bowl, whisk together Greek yogurt, ¾ of the lime juice and cayenne pepper. Season to taste with salt and pepper. 1. Place diced avocado in a large bowl and drizzle with remaining lime juice. Add corn, olive oil, jalapeno, cilantro, onion and Cotija cheese. Stir to mix. 1. Garnish with additional toppings, if desired. Serve chilled. Top with additional crumbled Cotija cheese and cilantro. Calories 160, Total Fat 9g (Saturated 2g, Trans 0g), Cholesterol 5gm, Sodium 60mg, Total Carbohydrate 21g (Dietary Fiber 4g, Sugars 3g), Protein 4g, Vitamin A 6%, Vitamin C 25%, Calcium 6%, Iron 4% *Nutritional values are an approximation. Actual nutritional values may vary due to preparation techniques, variations related to suppliers, regional and seasonal differences, or rounding.